What’s different about an inner ear infection? An inner ear infection is different than a middle ear Infection, which most commonly affects children. A middle ear infection develops when fluid builds up in the cavity behind the eardrum and a bacterial infection forms. An inner ear infection is almost always the result of a virus and can temporarily affect your hearing and balance. 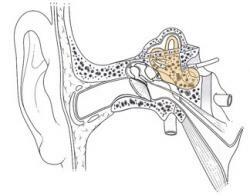 What happens if I get an inner ear infection? The inner ear, called the labyrinth, is where hearing and balance are controlled. The inner ear consists of cochlea: a snail shaped tube that transmits sounds to the brain and a vestibular system (a complex set of tubes and nerves) that manages balance. When either or both become inflamed from an inner ear infection, both your hearing and your balance are affected. This condition is commonly called labyrinthitis. What are the symptoms of an inner ear infection? The most common symptoms of labyrinthitis are dizziness, hearing loss, and vertigo (a feeling that the world is spinning around you). Some people have mild dizziness; others have difficulty staying upright. Hearing loss can be in one or both ears, but it is rare for hearing loss to be permanent from an inner ear infection. Symptoms of labyrinthitis are more severe at the start of an inner ear infection but diminish as time goes on. Depending on the severity of the dizziness/vertigo, you may have to stay lying down. And you definitely should not operate a vehicle. Always avoid using tools or working at heights if you have an inner ear infection, even if your symptoms are mild. Can I go to FastMed for an inner ear infection? Yes. FastMed walk-in clinics are located across Arizona and North Carolina. Find the office closest to you and come by because we don’t require appointments.